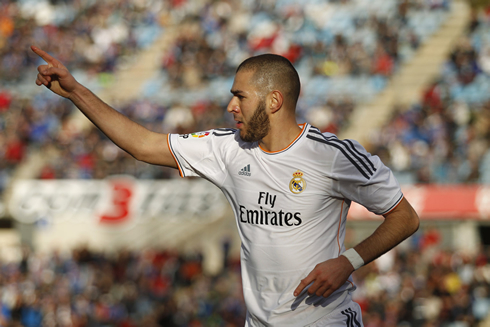 Real Madrid had no problems in dispatching Getafe this Sunday evening, after pulling off a clear 0-3 win. Cristiano Ronaldo wasn't eligible for this match as he had to serve his 2nd league game ban, but the Merengues still managed to easily edge their opponents, thanks to goals from Jesé Rodríguez, Benzema and Luka Modric. The Merengues travelled to the Coliseum Alfonso Pérez already knowing that both Barcelona and Atletico Madrid had secured another 3 points this past Saturday and they seemed to have dealt with that pressure quite well. 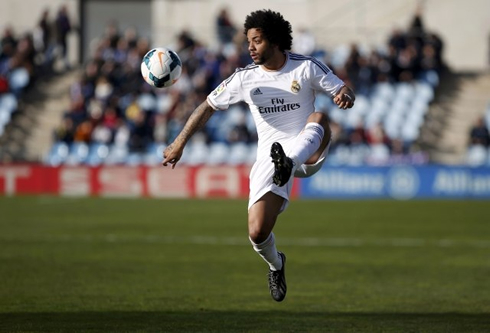 Real Madrid defeated Getafe by 0-3 and are once again tied in points with Barça and Atletico on the top of the league. Jesé with the opener, followed by Karim Benzema still in the first half and Modric later in the second, led the visitors to a quiet victory even though they couldn't count with Cristiano Ronaldo, still serving suspension. The Portuguese only has one game left to serve from his initial 3-game suspension, meaning he'll still have to sit out against Elche next Saturday, in what will be La Liga's next agended fixture. Without any UEFA Champions League or Copa del Rey fixture scheduled for next week, Carlo Ancelotti didn't feel the need to put into motion any sort of rotation ahead of this Sunday's game against Getafe. Real Madrid lined-up with Diego López in the goal, Marcelo and Arbeloa as left and right full-backs, and the usual partnership in the center of the defense between Sergio Ramos and Pepe. 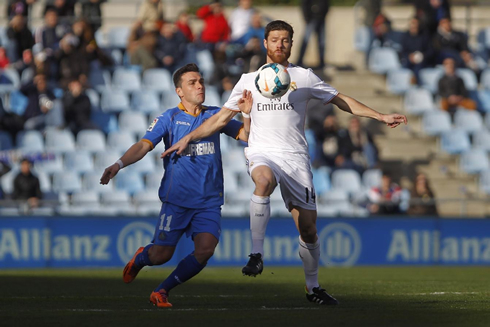 In midfield, Xabi Alonso and Modric led the troops, while Di María was given a more free role. Without Ronaldo on the pitch, the attack was left to Gareth Bale, Jesé Rodríguez and Benzema. The visitors broke the deadlock very early in the game, by the time we were about to enter the 6th minute of the first half. Gareth Bale picked up a ball in the center while he still was a few yards away from Getafe's box, left it over to Jesé Rodríguez on the left and then the Canterano simply embraced the responsibility of going for goal on his own. The 20-year old forward was immediately closed down by a couple defenders, but still managed to keep his composure and curl the ball into the far post. Splendid finish by Jesé, who got to score his 5th goal in La Liga this season, his 8th in all competitions. 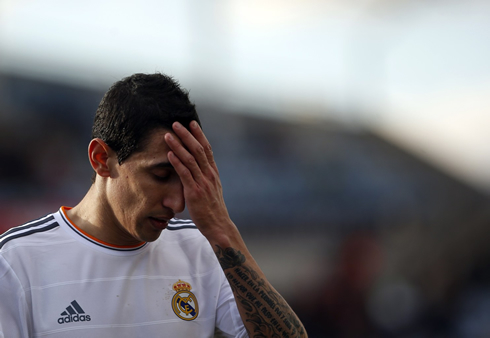 The 2-goal cushion arrived in the 27th minute of the first half and this time it would be Angel Di María delivering a great assist to Karim Benzema. The Argentina international picked out the former Olympique Lyon striker through a great cross from the left and then saw the Frenchman controlling the ball on his chest with great finesse, just before he finished it off with a strike below the goalkeeper's legs. Real Madrid had the game completely in control before we had even reached the first half of an hour and Getafe weren't showing any signs of being capable to still trouble the visitors. The Merengues went to the locker rooms carrying an always important 2-goal lead and certainly knowing that it had to be Getafe taking the risks in what we had left in the game to be played. None of the managers brought up any changes for the second period, but as expected, the hosts were trying to increase the intensity and push forward a bit more. It would only be a matter of time until Real Madrid would strike their final blow and that happened precisely in the 66th minute. 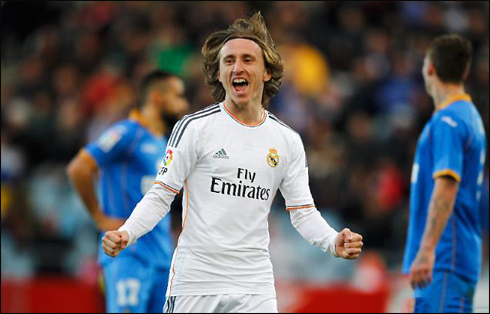 Luka Modric, the 28-year old magician born in Croatia, received a short pass from Marcelo about 5 meters behind Getafe's box and then onle needed one touch to set it up for his right foot and pick out Moya's bottom corner. 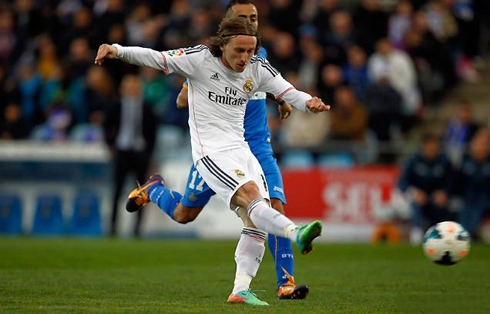 That was Modric's first goal in the league during this campaign, his second of the season. From that moment onwards, Getafe knew their hopes of still pulling out a positive result this Sunday had been completely crushed and Real Madrid also seem to have settled with the 0-3 as the final score. Even though Real Madrid won't step in for the upcoming UEFA Champions League mid-week fixtures, there will be a couple top clashes taking place in England that will surely draw everyone's attentions. First, a Manchester City vs Barcelona live encounter at the Etihad on Tuesday and then on Wednesday, a quite interesting Arsenal vs Bayern Munich collision at the Emirates, a game that will oppose the current Premier League and Bundesliga leaders. Real Madrid joins the action only on February 26 against Schalke 04, in a clash that should mark Cristiano Ronaldo's return to the line-up after having served a domestic suspension, and where everyone expects the Portuguese to spearhead his team to victory in Germany, as the Merengues walk into this tie clearly being the favorites. Cristiano Ronaldo next game for Real Madrid will be against Schalke 04, for the UEFA Champions League last-16 round first leg, on February 26 of 2014. In the meanwhile, you can watch Real Madrid vs Elche, Barcelona vs Man City, Brighton vs Hull and Arsenal vs Bayern Munich live, all matches provided from our football live streaming section.